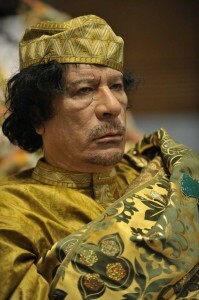 Moammar Gaddafi is rapidly becoming my favourite African politician to watch – for his eccentricity if nothing else. His African hospitality does not stop at strange and inappropriate gifts, he also insists on hosting guests in his home town, even when that happens to be in the middle of the desert – four hours from Tripoli. As current President of the African Union (AU), this week he is hosting the 50 continental leaders at their annual summit. He has managed to build a sort of African Strasbourg – full of conference facilities with delegates only once a year – and with no phone signals. So at a time when the continent is reeling from the global recession, scientists are demonstrating that it is being disproportionately affected by climate change and there is a disturbing upsurge in conflicts, piracy and coups, what did Col. Gaddafi choose to put at the top of his welcoming address? Why, a call for the nations of the Caribbean to join the African Union of course! Let us for a moment put aside the 12,000 miles, large ocean and continental plates that divide these two geographies and ask what the Caribbean nations might gain from joining the African Union and beyond that, Gaddafi’s other big idea – a United States of Africa. Pan-Africanism has a long history and many notable post independence leaders (starting with Nkrumah of Ghana) felt that the only way to solve Africa’s many problems was by its coming together. They point out that many of the borders of Africa as we know it today owe far more to the colonial carve up the 1880’s than they do to the tribes and peoples that live within them. These artificial frontiers have been blamed for much of the civil unrest and tribal rivalry which has troubled so many nations since independence and still spills out, in Sudan and Kenya to name but two of the most recent examples. The argument goes that only when the nation becomes Africa herself can such tribal rivalries be made so small and insignificant as to fade away. Of equal significance is the shape of industrial and commercial ties left as a colonial legacy to the continent. African economies were built by their colonial masters with the sole purpose of facilitating the transfer of raw materials and wealth directly out of the continent and back to the colonial power. Consequently trade routes between nations were then and remain now woefully underdeveloped. Only 10% of African trade is with other nations on the continent. Even today, the easiest way for me to fly from Zambia to most cities in the rest of Africa would be to take a route through London. The AU is only one of a myriad of different economic and trading blocs that are trying to establish themselves to redress this issue. Zambia alone is a member of both the Southern Africa Development Community (SADC), the Common Market for Eastern and Southern Africa (COMESA) as well as the AU. Sadly even within these groupings, trade remains stymied by high tariffs between countries, lengthy delays at borders and of course the need to change currency multiple times. As noble an idea as a United States of Africa is, I struggle to see how a continent wide arrangement could thrive where even these modest trading blocs seem to stumble. At a more fundamental level, could all of Africa collectively unite behind a single administration with such a vast and diverse geography, history and population? How would the Arab north relate to the Christian south? How would the few middle income regions find the wherewithal to support the many desperately poor ones? How much would old colonial ties continue to distort allegiances? There is a reason why so many of these regional blocs become known for being nothing more than talking shops. Finally, something on a lighter note (if not intentionally so). As I mentioned last week, the government of Nigeria and Russia’s largest oil producer Gasprom have signed an huge agreement for future investment in the country. So with some fanfare this week the name of this new venture was announced: Nigaz. True story and in true Russian style, their PR Director needs to be taken outside and shot.